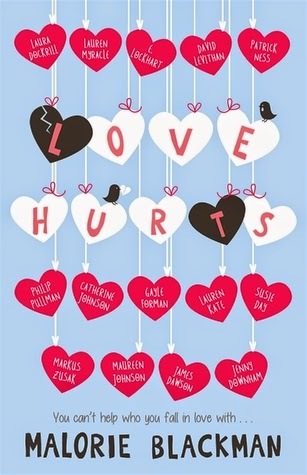 Love Hurts is a collection of extracts and short stories concerning all types of different love and is edited by the marvellous Malorie Blackman. I was very excited to hear about this collection a few months ago and I quickly downloaded my copy of the book from Netgalley. I originally thought this book would contain all original short stories from this amazing array of teen authors, however, there are only 5 new stories in Love Hurts and the rest of the book is filled with two other short stories that have appeared in other collections and also extracts from other YA books already in print. Besides the introduction from Malorie Blackman, which I was always going to read, my original plan for reading this book (once I realised about the format of the book and the extracts) was to skip over all the extracts and just read the new material. However, once I started reading this book, it made me feel all fuzzy and happy and hopeful that I couldn't pass up reading the extracts, even if I'd already previously read the books. I won't mention all of the extracts specifically, but it was nice to return to some old favourite stories (like the extracts for Noughts and Crosses, Northern Lights and I Am the Messenger) and new favourites (like the extracts from Trouble, Midwinterblood, Forbidden and Heroic) and to also discover some authors and stories that I haven't yet read but now want to (specifically the extracts from Grasshopper Jungle but I also must get a move on and read More Than This already and also more David Levithan). There were also two short stories that have appeared previously in other collections: Miss Lucy Had A Steamboat by David Levithan, which appears in How They Met and Other Stories and Endless Love: the Valentine of Daniel and Lucinda by Lauren Kate, which appeared in Fallen In Love. I had already read the Lauren Kate story and really enjoyed it, but I hadn't read the David Levithan before now. I thought Miss Lucy Had A Steamboat was a really fun and interesting story about a girl's consuming relationship with another girl and the realisations that she comes to when things don't quite work out. But while I found myself utterly surprised by how much I enjoyed the extracts it is really the original short stories that really stood out while I was reading this collection. Because of the diversity. There are characters in these short stories (and extracts) who are gay or bisexual, transgender, there are people of colour and some characters that are differently-abled or have chronic illness. At least one of the extracts mentions the Sikh religion (I believe?) and all I want to do is stand here and applaud this level of diversity within this book. I'm only going to mention my absolute highlights but know that I really enjoyed The Unicorn by James Dawson about the forbidden relationship between two men in the Navy during the Korean War and also The Liar's Girl by Catherine Johnson about another forbidden relationship from London in 1829 between two people from very different backgrounds. Humming Through My Fingers by Malorie Blackman is the first story in this collection and it is about two people having a conversation at a sports day and tentatively agreeing to a first date. It's quite cute with some awkward and mortifying moments that I couldn't help but smile at these two. But things aren't quite what they seem and motivations are questioned. I loved that surprise. Then there's Tumbling by Susie Day which made me smile endlessly. I love that the majority of this short story is about one girl obsessing over her first meeting with her crush. Worrying, second-guessing herself. I can completely relate. And a lot of this story is about two fangirls who come together which just makes me happy. Because while I have not watched one single episode of Sherlock after reading this short story, I really wanted to. This story was so sweet and cute and I nearly cried at the end. But it was Gentlewoman by Laura Dockrill that made me cry actual tears. Good ones, though. Gentlewoman starts with two old friends not having a serious conversation. Not speaking the words that need to be said because those words are already probably known. I loved this story so much. I found it amazing how much was said in so few words. And it is the ending, in which there was so much acceptance that made me shed tears. It's not perfect because that's the world we live in, but acceptance from those that matter to us is what's important and I love that that was found in this story for these characters. The thing that sticks out the most from reading Love Hurts is that love it out there for everyone and that love is one of those things that can be both really amazing and also really painful. And this book shows it all to us from awkward first meeting to first kiss to all-consuming relationships to real heart break. And everyone deserves love - soldiers, siblings, girl and robot, friends, strangers, online acquaintances and these romantic pairings can come in all sizes and shapes. I really enjoyed this collection and I hope you pick it up too! I loved Gentlewomam so much, the ending was just so uplifting! I was dreading something bad happening to Danni and that was a lovely surprise.